Pennsylvania Railroad class B-4a No. 643, a 1901 Juniata-built 0-6-0 switcher owned by the Williams Grove Steam Engine Association (WGSEA) at Williams Grove, Pa., returned to service in early May, thanks to a four-year effort by a small band of intrepid steam locomotive enthusiasts. No. 643 under steam in May of 2006. Pictured in photo are Mike Travis on tender, Thomas von Trott, engineer, and Frank Arndt on front. Photograph by 643 crewmember Jonathan Anschutz. In an effort that would be daunting to much larger and more well-equipped museums, this band of 20 dedicated volunteers removed the boiler from the locomotive frame, shipped it by truck to a boiler shop, and then, when the work was completed, put the whole thing back together again. Fortunately, one of the leaders of the project was an experienced facilities maintenance engineer, and he planned the project. 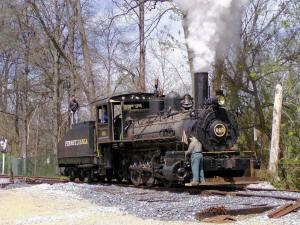 The locomotive was taken out of service following the Williams Grove's September 2002 show and disassembly of the locomotive began at that time. During the next several months, volunteers removed the flues from the boiler, unbolted the boiler from the frame, and took off all the appliances. They also removed the wooden cab. The boiler was lifted off the frame by a hired crane in the spring of 2003 and taken to a boiler shop in Landisville, PA, where workers performed ultrasonic testing on the entire boiler, then replaced the crown sheet including all new crown stays, repaired boiler braces, installed new flues and pad welded several spots on the boiler barrel. The work was performed on a time-available basis to keep the cost down. By early spring 2005, the shop work was completed. During the time the boiler was off the frame, the volunteers took the opportunity to correct an old repair made to the rear of the locomotive&apos;s frame. An earlier repair left the frame with a serious sag, so they cut the lower frame chord and welded a piece of steel in the fill the gap, raising the rear end of the frame about four inches to bring it level again. They also string-lined the entire locomotive frame and made several shims to try to correct several twists. "The engine worked in a steel mill, where they are notoriously hard on equipment," said Bill Medlin, one of the volunteers. "The frame was twisted and bent." When the rear end of the locomotive was raised to level, it meant that the tender deck was too low, so a four-inch shim was fitted to the center bearing of each tender truck and wooden blocks were added to the side bearings. Then they discovered the coupler on the rear of the tender was too high, so they lowered it by turning the carrier iron upside down. The boiler was returned to Williams Grove by truck and carefully fitted back to the frame in March. The volunteers worked feverishly to get the locomotive back together in time for the annual meeting and dinner of the Williams Grove Steam Engine Association&apos;s scheduled for April 22. On Easter Sunday, the locomotive was fired up for the first time since September, 2002. The crew watched everything carefully, making adjustments and tweaking things as pressure rose. Fortunately, they had filled the boiler quite full, because they were unable to get either injector to lift water. They did make a short run down the track, but then dropped the fire. Work continued, with the injectors being disassembled and reassembled. One was made to operate, but the second one was still reluctant. In spite of the problem, the engine was successfully operated for the membership of the association. More tweaking and fiddling followed, and continues even now. 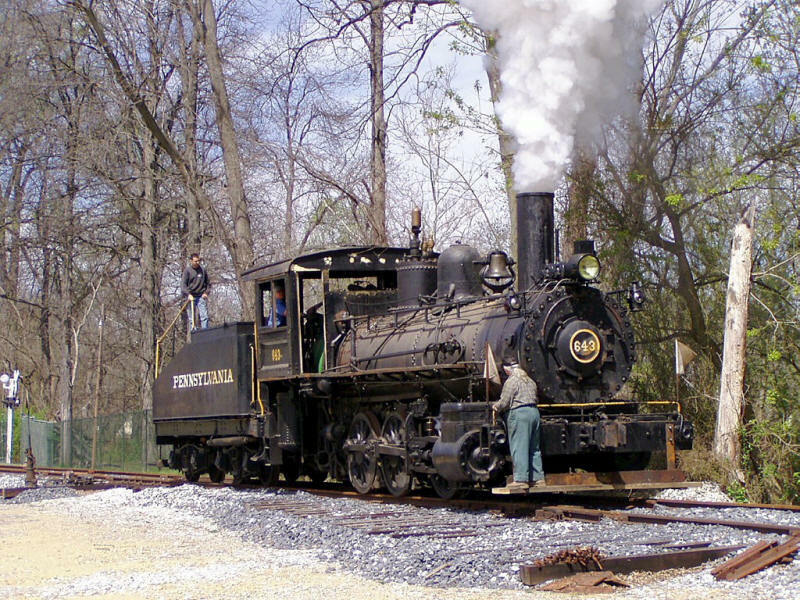 By May 6, the WGSEA gang felt confident enough to operate the locomotive for members of the Pennsylvania Railroad Technical & Historical Society, who were in nearby Camp Hill for their annual meeting. Several PRRT&HS members paid $75 to participate in an engineer-for-an hour program that day. The locomotive&apos;s electrical system is now being rebuilt, and adjustments to the firebox grates are on-going. Other teething problems are dealt with as they arise. The locomotive hasn&apos;t been painted yet, but that&apos;s on the list. They want to finish everything else before that takes place. The entire project cost about $50,000 and was paid for by donations from various clubs and interested parties. "Checks just showed up in the mail," said one volunteer. The return of no. 643 to service in this, her 105th year, just goes to show that persistence gets the job done. That the volunteers of the WGSEA accomplished an overhaul of this magnitude is a tribute to all of them.